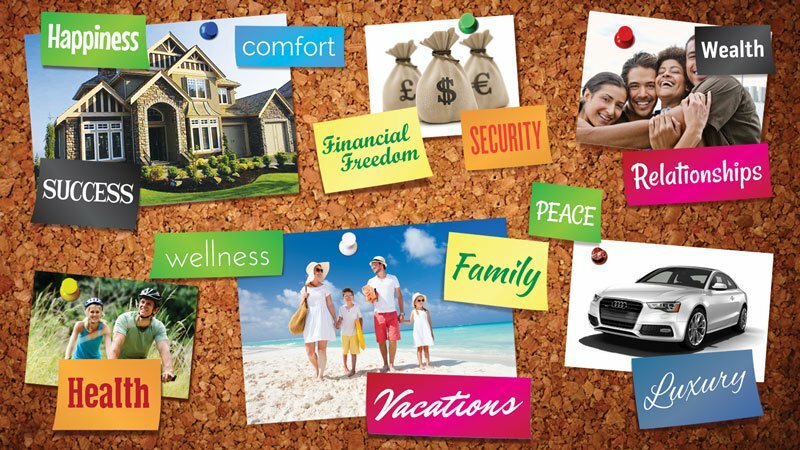 One of the best ways to stay focused on what you want is to create a vision board. A vision board is basically a collection of images that represent the thing(s) you want to achieve in your live. E.g. a career, a dream car or house, things in your bucket list etc. Having a think about what you want is step one to acheiving it. If you don't know what you what than the law of attraction can't help you because there is nothing to attract. If you have watched or read The Secret, then you probably already know about the Law of Attraction. Vision boards are mentioned in The Secret by John Assaraf. For those who haven’t heard of John’s story, it’s about how he made an amazing discovery of the power of visualization in his life. 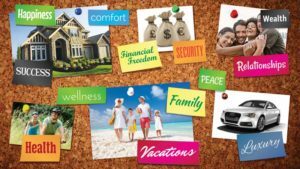 It’s amazing because John became successful, and when he was moving into a new house, he found one of his first vision boards. On it was a picture of a dream house, and it turned out that he had purchased that very house without realizing it! It is the very same house he now lives in. You have many options for creating vision boards, on your laptop, a physical board you can hang on your wall or you could just use Pintrest to create your vision boards. Or you might want to do all of them so it's a constant reminder of what you want so your are always focused. Once you've chosen the method you're going to start with, the next thing to do is actually think about what you want. It still amazes me how many people I meet that don't have goals, they're just going with the flow. There's nothing wrong with that of course but you're certainly leaving your future to chance as opposed to deciding it for your. You want to think about if you want to achieve one particular thing or lots of little things. For some people it's all about their career. Once they're doing what they want to do for a living, everything else falls in to place like, the house and car they want. For others, they don't have a particular career path but want certain possessions like a particular luxury car or a beautiful holiday home etc. One thing I don't recommend doing is putting money on there. Money is not a motivator, it is just the means to getting what you want. So focus on specific things you want as opposed to money which is very general so you will not see any benefits. Try not to have too many things on your vision board or you might loose focus. Having too many choices stops us making decisions so wanting to do too many things can blur our focus so you can end up with very little. It's not necessary to set a target but I find it focuses your mind a bit further if you have in mind when you would like these things. There's no point achieving what you want when it's too late to enjoy them. Make sure you're realistic about meeting these targets but don't be too pessimistic either. Once you've created your board, keep it somewhere you are likely to see it often. There's no point making it then forgetting about it. Defeats the whole object. You may also use it as your wallpaper on you laptop or phone. Frame it and put it on your wall opposite your bed might be an idea as you'll see it every morning. Our goals and aspirations can change as we get older so it's important that our vision boards reflect this otherwise it's a pointless exercise because if you don't really want whats on your vision board then you're never going to achieve it.